Dress and Textiles, Portraits: British 16th and 17th C 14 comments Who is the sitter, if not Blanche Parry (1508–1590)? While it would be wonderful if this were Blanche Parry, Queen Elizabeth I's constant companion for 56 years, it is most unlikely. Blanche was born in 1507/1508 and died on Thursday 12th February 1590 (modern dating), aged 82. This portrait is of a young woman wearing the fashionable court dress of the later 16th century – the hat and ruff are styles in fashion after c.1575. Both the style of clothes and the date mean that the sitter cannot be Blanche, but she could be one of Blanche's many god-daughters, many of whom were named Blanche, and/or a descendant of one of Blanche's Parry cousins. The painting was previously designated ‘Portrait of an Elizabethan Lady’ and by Federico Zuccaro (c.1542–1609), who was in England for only six months in 1575. 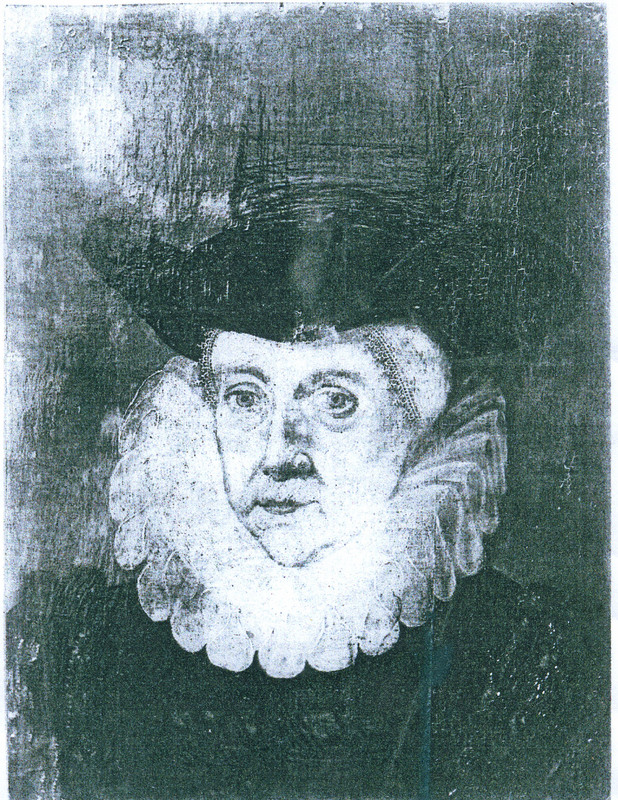 The whereabouts of this picture of Blanche Parry (1508–1590), if it still exists, are unknown (image attached). You are right that this cannot be Blanche Parry - in fact she was almost certainly dead by the time it was painted. This is a portrait of the 1590s, possibly even a touch later (c.1575 is much too early), based on distinctive elements in the sitter's dress - e.g. sleeve shape, open ruff, the deeply-pointed bodice and the 'great farthingale' supporting a very wide skirt (with pleated over-skirt). See the Ditchley portrait of the Queen for comparable elements: https://bit.ly/2AhmKoG . There are several even better analogues in Roy Strong's 'The English Icon', all dating from the 1590s. Once lost, Elizabethan portrait identities are hard to recover even when there is something helpful painted on it. Here we seem to have no coat-of-arms, no cartellino, no date/age or other inscription - not even a cryptic motto or line or two of verse to wrestle with. The best hope lies in interpreting some symbolism in what the sitter is wearing - a specialist skill that I don't really possess. There is a chance that the jewellery may yield a clue - the badge-like brooch on her sleeve, for example, might perhaps have heraldic significance. It's worth a shot anyway - Marion, any chance of a higher-res close-up of that? 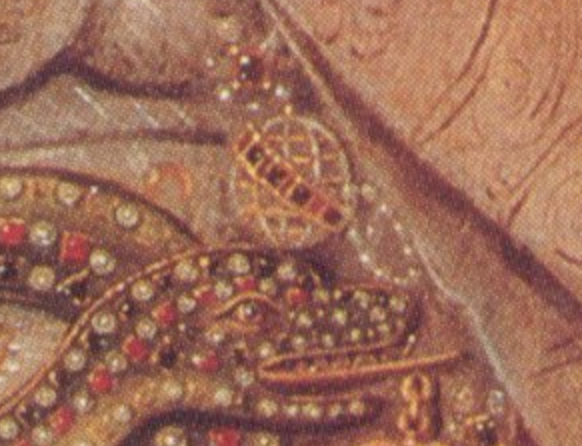 And also of the jewels at her neck - could the lower ones be doubled S's...and is that perhaps a globe above? 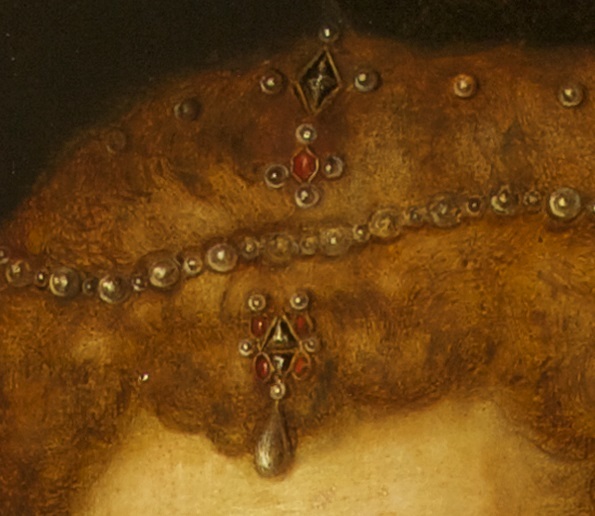 Oh, and while we're at it, the central jewels on her hair - especially the top one - deserve a closer look, if possible. I have attached four close-ups, including one of the spectacular lace, whose sections are embroidered with different flowers which someone may be able to identify. Is there any record as to where or when Newport City Council bought the painting? Elin, Newport City Council will probably have a record, but I don't know whether it would have been part of the loan documentation. Not necessarily, unless anyone asks for it. I will try to find out next week. Just looking at the jewelry thanks to the great pictures from Marion. Garnets - representing a pomegranate and the seeds of virility, fruitfulness. 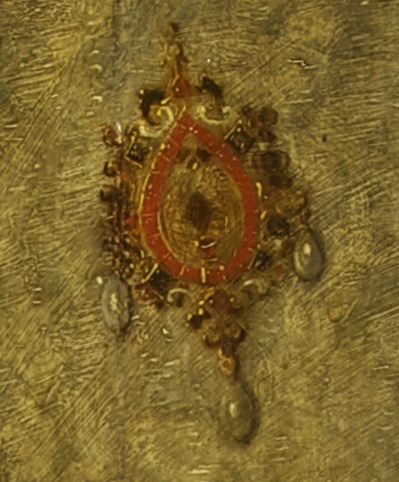 As this hangs, it is a pendant rather than a brooch which would have a bar. A pendant is a common gift for the times where-as a brooch would be a symbol of office. The necklace has the crescent moons and five pointed stars (mullet) and in jewelry terms the moon is a symbol of serenity and the 5 pointed star is a symbol of the 5 wounds of Christ. In heraldic terms the crescent moon with its pointed aimed upwards is "honoured by sovereign" whilst the star is "Honour and hope". The simplified globe in the centre is surrounded by the 5 pointed stars and crescents moons. Is this reference to Atlas holding the sky on his shoulders for eternity or a reference to sailing the world, guided by the moon and stars? The bend compony (angled sash) going across the globe in a series of 2 coloured square stones is a symbols of “Constancy" in heraldic terms. The diamonds in the necklace are all pyramid cut which means it dates to before 1570. After 1570, the diamonds were cut to an emerald cut and refract more light making them appear white in colour and round. The older ones look black and pointed on a triangle or square base. It may also be that the jewelry was older and passed down. Under the moon and stars, there are 2 hanging pendants which have the letter S intertwined in a mirror image. Could this be for Southwell? What great photos and what a great interpretation. Perhaps, then, this is Elizabeth Sydenham who became Francis Drake’s second wife. There are several reasons. First, the globe and it circumnavigation in this jewellery device matches exactly Drake’s device concerning his voyages in portraits of him. Second, this same jewel uses Drake’s ‘double star’ arms (‘fess wavy between two pole-stars Arctic and Antarctic’) that Elizabeth I gave to Drake in 1581 after his return from the circumnavigation in 1581. What is wavy between the stars if not the navigated globe? That the stars are five pointed is no problem as Drake’s stars took many forms, and the five pointed ‘five wounds of Christ’ might only add to the multiple significances. Third, Drake is famous for using celestial navigation (sun, moon and stars) on his voyages, and the moon (often in eclipse) is a common device used on describing his voyages. That this also means ‘honoured by the Sovereign’, as Angela Lennox describes, makes further sense, for this is exactly what Drake was. Fourth, the S motif on the jewels below can be taken to describe the Sydenham family that is attached in marriage to Drake. Fifth, it seems to me perfectly possible that the large pendant is either the ‘Drake Jewel’ itself (inverse side, with portrait of Queen Elizabeth covered by its lid) or more probably a companion to it that his wife wore. 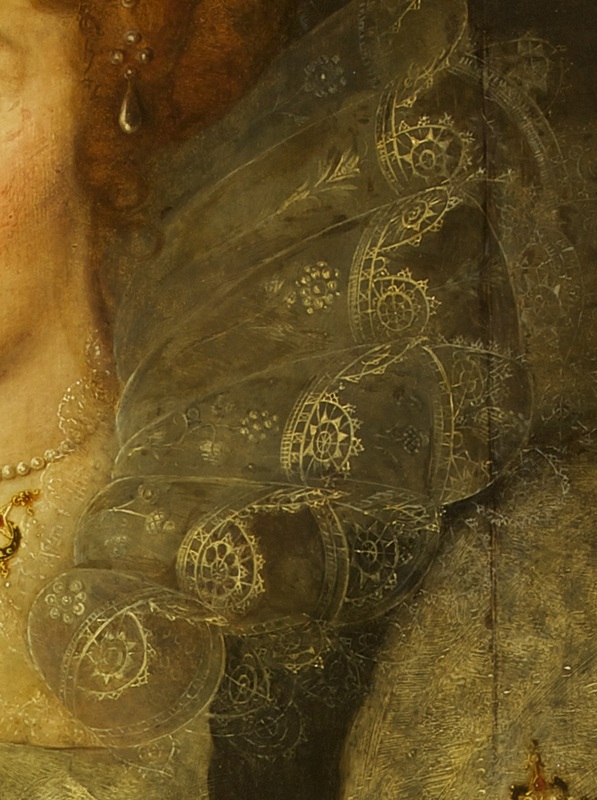 Another portrait of Elizabeth Sydenham (at Buckland Abby, https://artuk.org/discover/artworks/elizabeth-sydenham-lady-drake-147703/view_as/grid/search/keyword:sydenham/page/1 ) shows her wearing such a jewel that sports three pearls in the similar format to this one here, but perhaps the other way up, with a more circular ring of jewels akin to that found on the opposite side of Drake’s jewel. In this other portrait of Elizabeth Sydenham the cameo seems to depict a white figure that contrasts with the celebrated Afro-Caribbean cameo on Drake’s jewel. 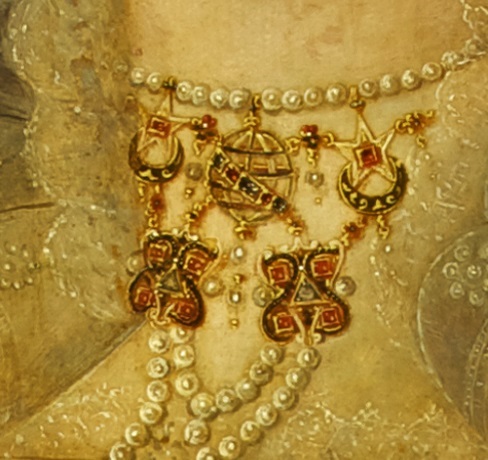 That Elizabeth Sydenham may have had a companion jewel is suggested by a contemporary portrait of Drake wearing his own jewel that then only had a single pearl (https://artuk.org/discover/artworks/sir-francis-drake-15401596-174654/view_as/grid/search/keyword:francis-drake/page/1 ). If anyone else wore this Jewellery, Elizabeth Sydenham might have had reason to be a little angry. These would seem to be recycled royal stones, and one might suspect even a present from Elizabeth herself (they married in 1585). If this was picture of Drakes 2nd wife we might expect a ring on her finger. 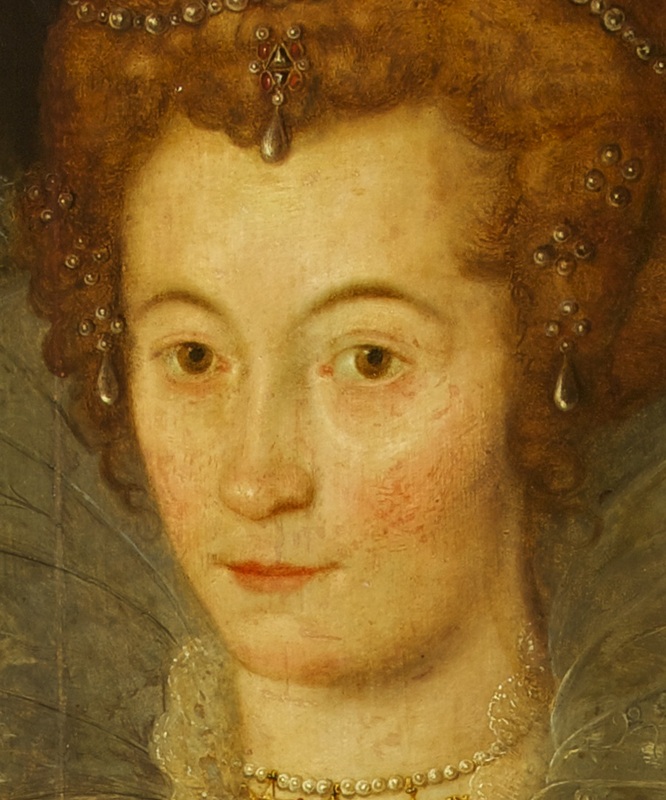 The Lady in the Buckland Abby painting is wearing four or five rings, and I do not think the face is a good match. Otherwise James' analysis of the symbolism in this painting appears to be very astute. Elin, thank you for your email. Please find attached a close-up of the sitter's face. This is a fascinating picture, thanks especially to the high quality photos that Marion has put up. I missed something in my last post: the compasses that are part of the lace, 'hiding in plain view' as it were. I wonder if anyone can identify the flowers (or trees). This is surely 'nautical'. I attach some images that show the close connection with Raleigh. 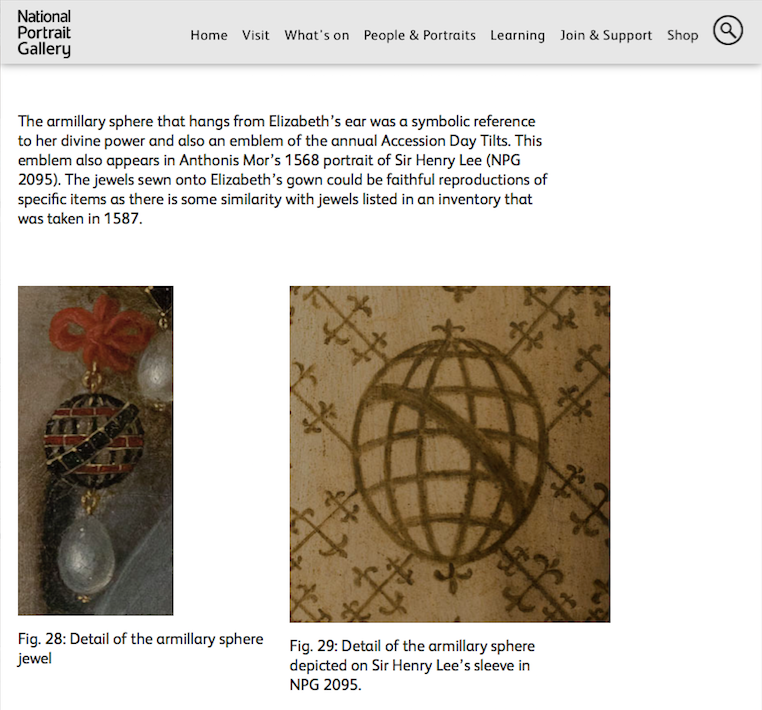 There might also be some merit is investigating the presence of the armillary sphere and the use of that device by Elizabeth I's mother's family of Boleyn. In this regard, see the article in Notes & Queries of 30th May 1868 on Great Forsters house, near Egham. The final line of the article describes the use of the armillary sphere in the house: "It is adjusted to a handle for convenient use, and consists of a framework that represents the general structure of the system of which our globe forms part - the sphere traversed diagonally by the zodiac." Can anyone tell me where this information is from please? Is it in relation to this painting? or am I reading it wrong? I imagine it's from the National Trust file on the painting. It's true it's not given on their website - but this is probably because previous attributions to Zuccaro are pretty much always ignored by art historians. His name was routinely attached by dealers to Elizabethan and even early Jacobean portraits in the late C19th-early 20th, rather as those of Gainsborough, Reynolds or Romney were to anything late C18th. I'm afraid Zuccaro is a complete red herring, as it is now known he was in England for just a few months in 1575, and painted only two portraits - full-lengths of Queen Elizabeth and Robert Dudley, Lord Leicester. As the sitter's dress testifies, our portrait dates from some twenty years later, give or take. '- Indeed, when I enquired [of the National Trust] I was told that it had originally been simply designated as an Unknown Elizabethan Lady.